Here we explain all essentials of entries for suppliers and their products in the RP Photonics Buyer's Guide. 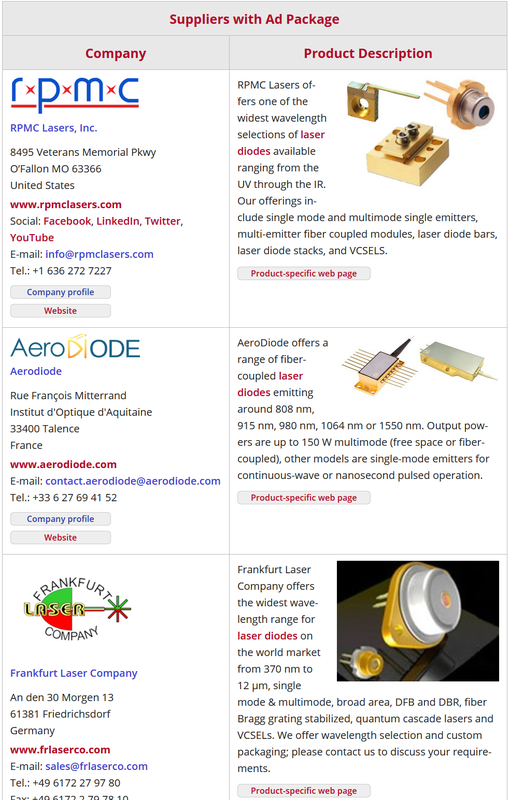 Note that we also have an article on photonics buyer's guides which discusses the use of buyer's guides in general. A basic company profile page, containing your contact information and a list of your products. Company profiles can be reached (a) via the general list of suppliers and (b) via the lists of suppliers for specific products. Listings for up to 10 products. For each product, a basic product entry (with your contact information and a link to your website) appears in the list of suppliers for that product. Your products obtain far more visibility with an ad package! You can display an unlimited number of products. For each product, you can publish a product description and a product image. This makes it far easier for our users to see what you offer, and motivates them to visit your site if the product description seems to fit their needs. Ads even appear in the related encyclopedia articles! The data for each product appear (a) in your company profile, (b) on the page listing suppliers for a specific product, and (c) even in the related encyclopedia article, if there is one. On the page with suppliers for a product, products of suppliers with ad package additionally appear in a separate table above the table with all suppliers (in random order). Your company logo and slogan are also displayed there. See also what appears in the related encyclopedia article – find the logos near the article heading and the detailed information towards the end in the section “Suppliers”. Your product description can obtain several links to specific pages on your website. By the way, we regularly check the links in your product descriptions – if we find any broken ones, we will report that to you. You are listed as an alternative supplier on the profile pages of other companies which offer such products without having an ad package! On your own profile page, there are no links to other suppliers. Your company profile becomes far richer with an ad package. It can contain your company logo, slogan and a company description. The description can be several sentences long and can contain links to specific pages on your website. You can also have links to your social media pages (Facebook, Google+, LinkedIn, Twitter, YouTube) and quality certificates (e.g. ISO 9001) displayed. You can list your distributors, or as a distributor you can list the companies you represent. We will announce your participation in upcoming exhibitions, if you tell us about them. You also get far more visibility in the list of all suppliers. A large advertising banner mainly gives you an additional branding effect. Included in the ad package is one skyscraper banner, which can be displayed in the right column of the buyer's guide pages (see the right side of this page as an example – many are our own ads). Whenever a page of the buyer's guide or the encyclopedia is called, the web server randomly selects one of the banners. All banners resulting from ad packages have the same display probability. For the buyer's guide pages, the total display probability of those banners is limited to 50%, and the display probability for each banner is limited to 5%. For the encyclopedia pages, the total display probability of the banners is limited to 10%, and the display probability for each banner is limited to 1%. You have no suitable banner file? No problem, we even help you with that! Our additional service: we produce your banner graphics from your inputs. For example, you may send us an image and some text which we will place on the image, together with your company logo. We can also cut off superfluous margins, rescale images etc. It may thus be sufficient to send us materials from other areas which we adapt to meet the above described characteristics. It is also possible to obtain additional such banners, possibly with higher display probability and for a limited time; see our page on advertising banners for details. One white paper or video promotion is included in the ad package. We place a preview in the corresponding encyclopedia article, so that it is seen by exactly those people who have an interest in the specific topic! You can occasionally publish your news on our company news page – for example, if you won a prize or expand your facilities. 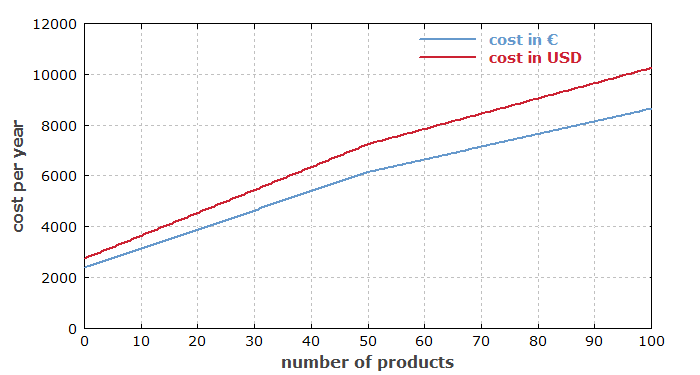 RP Photonics provides substantial statistical data to customers with an ad package. Such customers obtain a website link, containing a secret password, with which they can access the statistical information at any time. The data are regularly updated on the first day of each month or slightly later. 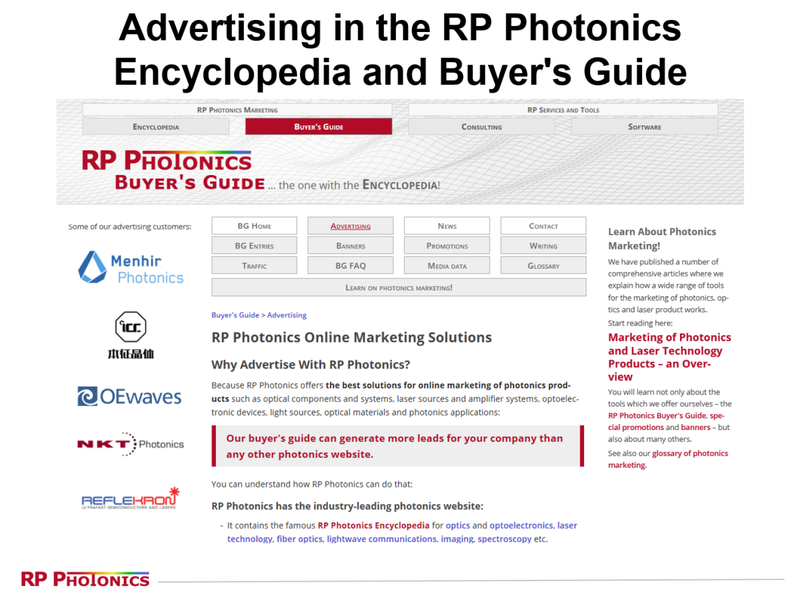 We are happy to give you detailed statistical data, demonstrating the superior advertising value of the RP Photonics Buyer's Guide! Traffic by pages: number of page views and referrals to the supplier's website – for the company profile, for each supplier page for a product of the supplier, and for each encyclopedia article in which an ad of the supplier appears. These data are the sums from the beginning of the current advertising period to the previous month. Traffic by months: number of page views and referrals by month for up to 36 months (possibly even beyond the beginning of the advertising). Shown are the data for the company profile and sums for all supplier pages and for all encyclopedia articles. We are happy to demonstrate to our customers how much our website is used, and how much benefit in the form of branding and lead generation they obtain from us. We strongly encourage you also to check the statistics of your own web server, so that you can find out how much traffic you get from as compared with other websites – for example, from other buyer's guides. What is the Cost of My Ad Package? You could easily spend more money for a single print ad than for great visibility on our site during a whole year! We also offer a trial for 6 months, costing just half the amount of one year. Enter input values with units, where appropriate. After you have modified some values, click a "calc" button to recalculate the field left of it. After one year, we will ask you whether you want to prolong your advertising. There will be no renewal without your explicit consent. Try it out for 6 or even only 3 months. Thereafter, make your final decision based on the statistical data. Because of our diligent service, it is entirely realistic that you get your entries set up within a single hour. Find the profile page of your company, starting from the list of all suppliers. In the profile, click on the button “Edit profile data” (near the contact information). Then just fill out the form, which is easy. See also the terms and conditions of the RP Photonics Buyer's Guide.